The most classic of Borg Polos a Wimbledon winner. 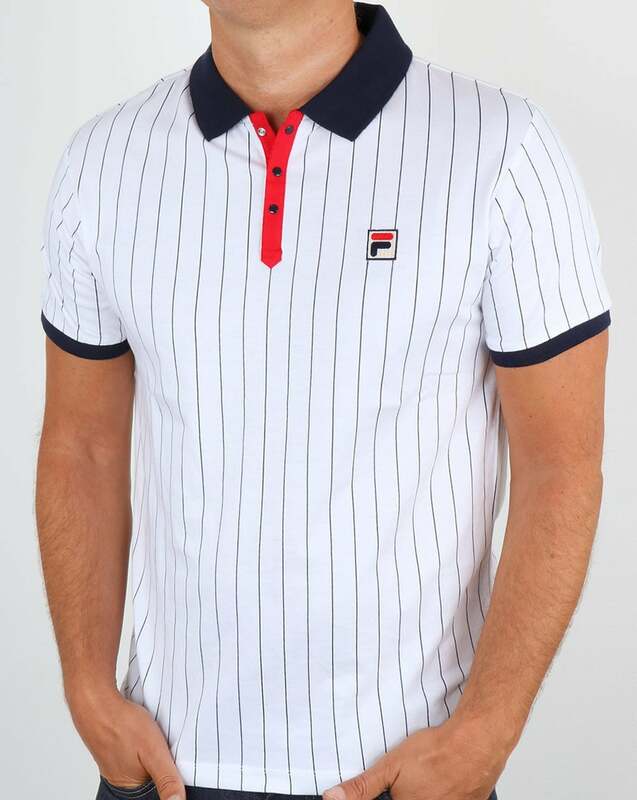 Exclusive to 80s casual Classics the most iconic Fila Polo the Fila Settanta renowned Birg tennis polo in white with red button placard with navy collar/stripe and Large F Badge- this is a slim stretch fit and some people choose to go up a size. The model pictured is a medium wearing a medium and a gauge to fit. This was one of Fila Borgs favourite Settanta designs although it was later swapped for the Fila Settanta Mk2 after fears tennis traditionalists might find the pins and contrasting collars design as being to "out there" for the tennis circuit - Wimbledon whites etc. In later years this design was a huge hit in the US that did not have the same dress code restrictions as Europe.